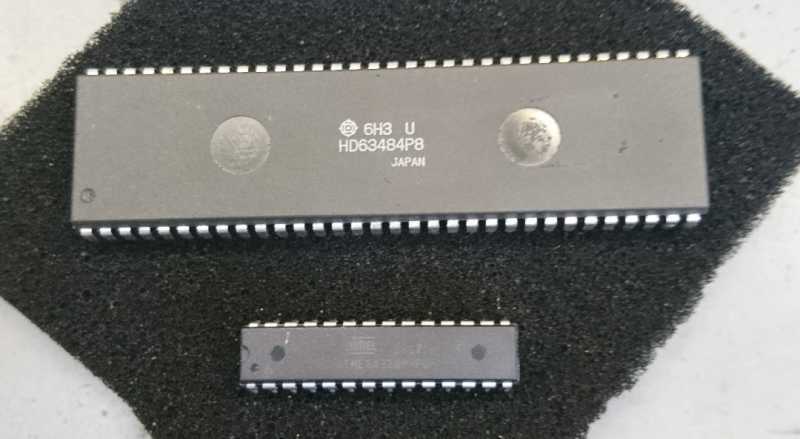 » Super set of ATMega328P-PU available? Super set of ATMega328P-PU available? I use the ATMega328P-PU (28 pin) in my projects. I have "standardized" it and I am happy with it. I like working with it and are learing as much as I can (time permitting) about it. Some times I wish i had more digital / analog pins (with out a multiplexer) or a second USART (with out software emulation) and so on. I am looking for a chip that is a super set of the 328P-PU, something with maybe 40 or 60 or so DIP pins. I know the 2580 is "bigger / better" but it does not come in a removable DIP package. So does such an animal exist? So I can use my Arduino source code developed for the 328P-PU seamlessly on this "bigger" chip and take advantages (as needed) of it's additional abilities AND has a removable DIP pin arrangement. If such a creature is out there... please tell me. I used the Atmel Parametric Product Selector and filtered it for 8-bit AVRs with two or more UARTS, 10 and more ADC channels. Disregarding the XMegas, I came up with only the ATmega640/1280/2560 and the ATtiny441/841. None of them are available in DIP. They have 2 UARTs. But the ADC multiplexer still only offers 8 inputs. If you want "lots of UARTs" and "lots of ADCs" then perhaps the Xmega range beckon? Downside of Xmega: 3.3V only (no 5v) and apart from some that I have in a box that Atmel sent me as a "special present" you won't see Xmegas in DIP packages. Of course if you reach Xmega specs. then I would just take the next obvious step and go for Cortex M0, M3, M4 and leave 8 bit behind all together. So does such an animal exist? Optionally, a 5V, 500mA low quiescent current (23uA) LDO regulator can also be installed, which supports up to 24V input. Along with the 5V regulator, an 8-bit auto-direction sensing level shifter is installed, to provide level conversion between XMEGA Vcc and 5V (or 3.3V). There are of course gazillions of DIL modules with bigger chips on from just about any family range you care to mention. TBH, once you are comfortable programming an AVR in C, making the leap to a different chip range isn't that hard. But, to be honest, looking at that should immediately show why DIP over about 40 pins is just plain impractical! Dip packages are so 20th century! Time to up your skills to SMD and join the fun, its just not that hard to learn! awneil is quicker than me! in Search enter TQFP-100 to see the kit if want to DIY. Some posts here on drag soldering QFP. Might be able to drag solder QFN (I haven't tried); hot air may be better for QFN and DFN. OP seems to be in love with some DIP. There are of course gazillions of DIL modules with bigger chips on from just about any family range you care to mention. So, until OP wants to lay out a custom production board design, why not just have your cake and eat it to by getting an Arduino Mega which gives you access to all the signals "through hole", probably has power conditioning and reset circuit and ISP and connectors and ..., and maybe a couple buttons and LEDs? ...and will probably cost less than getting a few pieces of the AVR itself. board area is probably no more than a DIP adaptor! and you get a full debugger! Theusch: Arduino Mega would be the obvious answer. I have played with them, testing. My projects are battery powered in remote places and not easily accessed especially in the winter at -20 F and 4' of snow! So the Mega fits the bill BUT I can not get the kind of power savings I can with a bare bones 328P-PU in sleep mode. If I could get the Mega chip by its self that is what i am trying to see. My projects are battery powered in remote places and not easily accessed especially in the winter at -20 F and 4' of snow! What does that have to do with insisting on DIP parts? So the Mega fits the bill BUT I can not get the kind of power savings I can with a bare bones 328P-PU in sleep mode. Perhaps I think I see what you are saying ... if you use an Arduino/clone based on Mega2560 then that generation of AVR doesn't have as many power saving features. But aren't there Arduino model lines based on other Mega models? Dunno. I hope that 'Freak ka7ehk comes across this thread, as his current life seems to involve developing remote sensor/monitors. Perhaps he can comment whether DIP means better designs. f you use an Arduino/clone based on Mega2560 then that generation of AVR doesn't have as many power saving features. But aren't there Arduino model lines based on other Mega models? Dunno. Exactly what I am trying to say. The Mega2560 has all the bells and whistles I want (and i assume my 328P-PU code will run with almost no mods) but more critically it is a full board, just like a Uno clone board, and thus a power hog. So I seem to be able to have one thing (super sent of the 328P-PU's capabilities) OR great power savings (sleep modes with out all the extra power consumption of a board with LEDs, power converters, etc) but not both. I am not aware of any 2560 clone boards that just have the pin headers with out all the extra stuff I don't want. That is what I was hoping to do. For me the 2560 is ideal (from what i have read and assuming I do not have to re-write all my 328P-PU code). The problem is unlike the 328P-PU it only comes as a complete board: like an Uno. So I would have to hack away at the SMT of each board to get rid of the power regulator, LEDs and other junk: and I am sure I will make a mess of it and ruin each and every board in the process. The Mega2560 has all the bells and whistles I want (and i assume my 328P-PU code will run with almost no mods) but more critically it is a full board, just like a Uno clone board, and thus a power hog. Indeed, if you are running a 'PA with a sleeping BOD and deep sleep modes -- a '2560 of a previous generation won't have as low average uA. But a few uA, while it might indeed be a critical criterion in your design, is not a reason to jump to "power hog" without justification. My low-power production apps over the years are "full boards". Indeed, a '2560-based board may not be suitable for your app, for whatever reasons. But that isn't what I advocated -- I suggested getting a ready-made dev platform to avoid the apparent DIP requirement. I suggested getting a ready-made dev platform to avoid the apparent DIP requirement. That would suit the bill for me. Last two might work if willing to remove the no multiplexer requirement. Are port expanders (via TWI or SPI) acceptable? Could power cycle the mega2560 but the charge for POR and LDO would need to be evaluated. How about an ATtiny1634, 20 pin dip, two usarts, may not have as much io though. Will all my code written for the 328P-PU still work on these boards? I am going to take another look to whats out there. If I can only find a 2560 board that is stripped down that would work for me. But then i guess I need a different cable to up load my code but that should not be a big deal. If only I can disable ALL the extra stuff on the Mega 2560 board (LEDs, power converter, etc) then I would have basically what i want. My code seems to run fine (so far on the board) and I assume I can do all the "sleep mode" tricks I do on the 328P-PU board as well. I use ATmega1284P's in the 40 pin DIP package. Pin numbers for I2C and SPI are different, as are timer registers, I think, but other than that all my ATmega328P code runs fine. BTW, I just saw this picture of the 328 on the Microchip site. No more Atmel, and apparently no more date. Thank you for the tip: I am gonna read up on it now. Just looked at the 1284: This is what I am looking for in the right direction. i would like more USARTs but 2 will surfice. 3 interupt pins is still better than to. If my code can port with minimal re-write this might work. If you need more UARTs you might be able to copy your code into the Arduino IDE and use the Arduino SoftwareSerial function, which seems to work. You need to compile in Verbose mode and then find the .hex file at the bottom of the IDE to download to flash in the 1284P using your regular programmer. There seems to be lots of stuff in Google about using the 1284P with Arduino. The IDE will compile straight C code just fine, at least for the ATmega328P. You don't have to use any of the Arduino functions or pin numbers, and you don't need the Arduino bootloader to program the ATmega if you use your usual programmer and the generated .hex file. The usual PORTs and PINs compile fine. I don't know if this helps, but it is one way I have thought about to use the Arduino libraries. I have only experimented with copying a C project into the Arduino IDE, compiling, and getting the .hex file. I have never actually used any of the Arduino libraries for anything; just thought about it. There seems to be lots of stuff in Google about using the 1284P with Arduino. 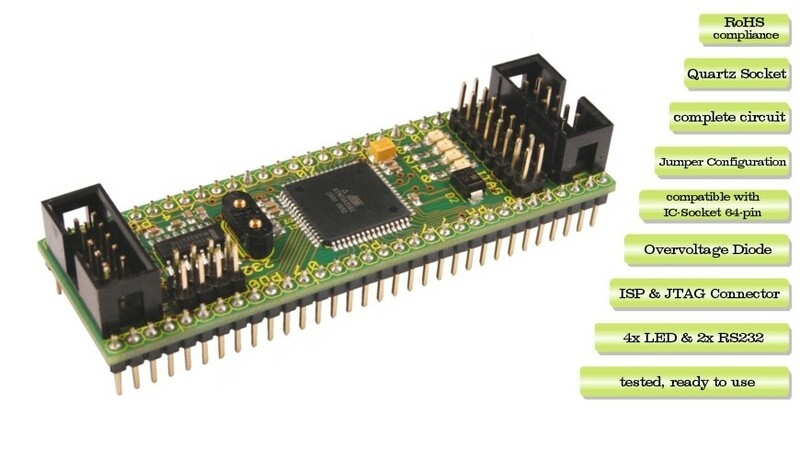 The Arduino framework is in PlatformIO with 15 mega1284P boards. That will take you back into the ATmega640/1280/2560, 100 pin beasties. But not PDIP, will need to use an adapter like shown above. I am gonna try out the 1284: It seems to meet my criteria (more pins, more USARTs) and is a DIP package (so i can make a bare bones board). If my 328P-PU code (Arduino) compiles and loads with minimal work and I can play the same "memory saving calls" on the board that should work for me. Thank you all again! I am gonna try out the 1284: It seems to meet my criteria (more pins, more USARTs) and is a DIP package (so i can make a bare bones board). One thing to watch on the 1284P...there can be issues if your layout is not 100% solid and you are not running in full swing crystal mode. There seems to be some sort of odd interaction between the second serial port and the oscillator. Run in full swing and you'll not have a problem but that might impact your low power aspirations. Brian: Thank you for the heads up. If you mean full MHz the XTAL is meant for then yes, i never try to save power by reducing clock speed. I try to balance the savings in power vs. eliminating yet one more thing to go wrong and have to figure out during a debugging in the field. I will keep your tip in mind, thank you! If you mean full MHz the XTAL is meant for then yes, i never try to save power by reducing clock speed. I just now saw my "name" referenced, up in the thread. I don't use DIP because I want smaller size AND pick/place manufacturing. If you look at the Electrical Characteristics of the spec sheet, there is nothing about power consumption differences based on package type. That is because they all use the same die inside. Its just how that chip is wire-bonded (or what ever else the manufacturing process uses for versions like LCC or BGA) out. DIP and SMT all use the same die, same pin drivers, same oscillators, same everything because it IS the same die. Yes, for development, DIP can be easier to work with. Yes, for maker projects, DIP can be easier to work with. But, as was shown above with the "breakout" boards, you can have an SMT version that you can work with in DIP form. Seems to me to be a non-issue. 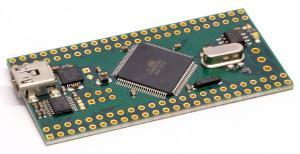 Now, when it comes to parts with more .... like more UARTS or more GPIO pins, then you are no longer talking about the same chip. More pins, especially. DIP packages are expensive. They are especially expensive when it comes to putting the chip into the lead frame and making the pin connections. And, as far as industry is concerned, area means coins of the realm. Smaller means less cost (and more profit or more competitiveness). You do not get small with a 48-pin DIP! Makers, so sorry, but you are NOT where the money is. It is Section 9.4 in the 1/2015 datasheet but Section 10.4 in the 10/2016 data sheet. I didn't know this was a problem. Thanks Brian. I always use full swing these days after Cliff recommended it. AVR_beginner, full swing means you can get a clock signal off of the XTAL2 pin, I believe. You need to set the fuse to full swing, and use the longest startup time to make sure the crystal gets started OK, unless you need the chip to start right away after power up. Most of the Arduino's I've seen don't use full swing, I guess because it needs more power. But don't forget to set the clock fuse to full swing to avoid the problem Brian brings up. Select one of the full swing crystal modes from the fuses, the one shown should work well. OK: dumb question here (please keep in mind I have touched a 1284P yet). Does any of this "full swing" stuff apply to the 328P I am already using extensivly? In other words: is there something i havebeen mssing all along? I keep my 328P at 16MHZ (The XTAL) even when in sleep mode. I have not mucked around with trying to slow down the clock. the reason being my devices operate in harsh environments (deep cold that can get to -40C / -40F) so i don't want to push that envelope yet. So... do i need to start learning about "full swing" for the 328P or am I free to go happily on my way in blissful ignorance (for now)? Not sure if there is a list of chips so effected. A possible work-around for mega168PB is tiny1617 with a port expander as tinyAVR 1-series have a 20MHz (+/-3% typ) RC oscillator. A 20MHz CMOS MEMS oscillator with a level translator (3V to 5V) is a mega328PB alternative but would consume an estimated 1mA more than mega328P 20MHz full swing internal crystal oscillator. Full swing setting is being removed from at least some (all?) of the chips...this mostly implies you can't go above 16MHz using an xtal, but you can with an oscillator (now.... don't ask what's an xtal oscillator). Interesting to learn from this document (page 2) they have some of their chips made by Panasonic!!! Does any of this "full swing" stuff apply to the 328P I am already using extensivly? Yep! Just open your fuse settings and see. Does that work? in other words, does studio know if you are connected to an old mega48 that supports full swing vs a newer on that does not? Even on the newer chips, perhaps you can still set the fuse bits to a non-existent mode (such as burning in old elf files into a newer chip that lacks full swing)...Maybe this was all seamlessly taken care of by the latest studio upgrades, making an illegal selections impossible? Maybe all you will see is studio allowing you to set (& see ??) modes that don't actually exist. For interest, I visited Atmel's site & downloaded all the '168 & also'328 datasheets. Many datasheets (2015 & later) indicated full swing as though nothing changed and made no mention of change; others listed it--but only way back in the revisions section, it said the mode was not available! In other sheets, it was deleted from the descriptions in the first place....so much for chaos & wondering what is going on!